Memorial Day: Let’s Not Forget! 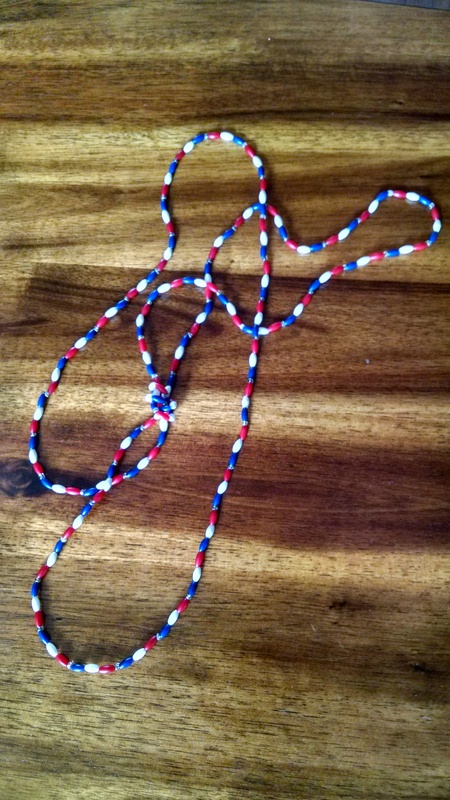 In honor of Memorial Day, I wore this red, white, and blue necklace. My sister Shelly made it for Mom, wife of a WWII vet. Among Mom’s belongings when she died, the necklace might not have seemed important, but to me it symbolized her love for our country. Growing up in her house, I learned to be proud of our country, love its flag, and honor those who served and fought for our freedom. Even today, the moment our national anthem starts, I can’t help but stand — at home alone or in a crowd — to sing along with my hand over my heart. A heart that almost bursts with pride for our United States of America — our land of the free and home of the brave.. So many memories spring to life on Memorial Day! Family who sacrificed to serve in the U.S. Armed Forces — Dad and Jim’s dad (WWII, Army), Uncle Lee (WWII, Marines) Uncles Hank and Ed (Korean Conflict, Army) brother-in-law Larry (Vietnam, Army), and my son Rick (Navy). Involvement in the American Legion Post in Kaukauna. Dad served a year as Commander, Mom as leader of the Legion Auxillary, and I as leader of the Junior Legion Auxillary. Memorial Day meant Dad leaving early to blow TAPS at each cemetery as flags were placed on the graves of deceased vets. Later when the parade paused on the Lawe Street Bridge and the memorial wreath was cast into the Fox River, he played TAPS again. A solemn and beautiful moment in time. One year I served as a poppy princess. Another year, as a teen, read “In Flanders Field” to the townspeople who gathered on the lawn of the VFW Hall for formal speeches. The many years that my husband Jim and I took time to honor our country and its vets. Most times we joined the crowd outside the Social Services building, and every time the U.S. flag passed by, we’d place our hands over our hearts and stand at attention. What fond memories spring to life for you on Memorial Day? What if you were sixteen years old and suddenly made president of the United States of America? What would you do? Long ago, Josiah faced that horrendous problem when made king of Judah. For the next four years he sought God for wisdom for his chaotic land. Then, realizing the nation’s troubles were a direct result of the stench of the people’s sins and disregard for God, he set about to cleanse his country. He ordered all carved idols and cast images, all pagan shrines and altars and Asherah poles torn down and destroyed. It took six years. Next, he sent for workers from all over the land to come to the Temple in Jerusalem. They set to work repairing, renovating, and restoring the magnificent worship center that Judah’s earlier kings had let fall into ruin. In the midst of this work, the High Priest Hilkiah found the Book of the Law of the Land and sent it to the young king. Josiah tore his clothes in despair. “The Lord’s anger has been poured out against us because our ancestors have not obeyed the Word of the Lord, “he cried. He then sent Hilkiah and others to ask the Lord what they must do. The prophetess Huldah gave them a message from God. Yes, the curses written in God’s Word would come to pass because the people had abandoned him and worshiped other gods. But, because the king had humbled himself and wept before the Lord, wanting to change his ways and the ways of his nation, God would not send the promised disaster during his lifetime. Josiah took swift action. He summoned all the people to the Temple. There he read the entire Book of the Covenant and renewed that covenant with God. He pledged to keep its commandments with all his heart and soul and required his people to do the same. Everyone made a fresh start. Throughout Josiah’s lifetime, they worshiped only the Lord God. They lived in obedience to his Word, and God blessed them for it. We now live in times where our nation is in great danger. The people in these United States live largely ignorant of the great precepts of our United States Constitution. They barely think of, much less prize, its amazing freedoms which are fast eroding before our very eyes. As a result, these freedoms given to us by God who impressed them on the hearts of our founding fathers may soon disappear. Unless we turn away from our selfishness and turn back to honoring God and this country which he raised up as a haven where all men (and women) are created equal, we have little hope. Yet it’s not too late to choose God’s way and save our land. God’s Word states it clearly. Focus: “Live in such a way that God’s love can bless you” ~ Jude 1:21, New Living Translation. How about you? What can you do so that God can bless you and our nation? How can you help turn things around in our nation? Who did they cry out against? What was the slavery? According to Psalm 2, none other than the Lord God because they didn’t want him telling them what to do. Neither did their citizens. If a situation called for a little lying or stealing or cheating, why not? If they felt like using God’s name like a swear word, so what? If keeping their businesses open on Sunday meant turning a bigger profit, that was their call. If they ignored their parents or any other authority–who, by the way, weren’t all that wise or great anyway–that was their call. If they found someone attractive and wanted to sleep with that person without benefit of marriage, hey, whose business was it but theirs? Who did God think he was anyway? And what about the many world religions with plenty of gods to chose from? Worship only the Lord God? Obey only him? Forget that! So they raged on and plotted, filling willing ears with their own version of right and wrong. Inviting others to join their enlightenment, they truly believed they were working toward freedom. But the Lord God shook his head sadly. He never meant his rules to enslave! He set those boundaries to protect his people, to free them to live in peace and safety and love with one another and with him. Yet each had to choose this peace and safety and love for themselves. Free choice was his gift to each. Yet to keep us from being destroyed by our freedom, he daily urges us to choose wisely. Focus: “Be warned … Serve the Lord with reverent fear, and rejoice with trembling. Submit to God’s royal son … what joy for all who find protection in him!” ~ Psalm 2:10-12, New Living Translation. How about you? How do you choose to use your God-given freedom?